Perhaps one of Southeast Asia's most famous food scenes, Gurney Drive is the place to go in Penang — Malaysia's island held dear for its culinary traditions. Sure, there are strips of hawker carts found all over Georgetown, and the food courts house loads of tasty options under one tall roof. But Gurney Drive is a scene, enjoyed by local families, couples, and international visitors. Unlike the other options, you get to enjoy a sea breeze and coastal view while eating and people watching. What Is Gurney Drive in Penang? Gurney Drive is a walking esplanade with a strip of bars and restaurants located on the coast in Georgetown on the island of Penang, Malaysia. Penang is a large island on the west coast of Malaysia, south of Langkawi and not far from the Thailand border. Although Gurney Drive became famous for the large camp of carts proudly cooking up some of the best Asian street food around, there are Western chains and upscale eateries in the mall next to the carts. Outside of the mall and food cart area, Gurney Drive is lined with bars and a mix of eateries. Seafood and steamboat restaurants (a social, cook-at-your-table experience) abound. Gurney Plaza is Penang's second-largest shopping mall; there are nine floors of retail and eateries! It also houses a 12-screen cinema (with many titles in English) in case you want to turn your food experience into a dinner-movie date. The bus stops in front. Enjoy the air conditioning for a few minutes as you walk straight through the mall to the coast where the good food is located! Despite extensive coverage by food magazines and guidebooks, Gurney Drive is still frequented by mostly locals. Prices are still reasonable, although cheaper food can be found elsewhere in Georgetown. Penang residents gather in groups on weekends to stroll along the pleasant, seaside esplanade while socializing and eating. 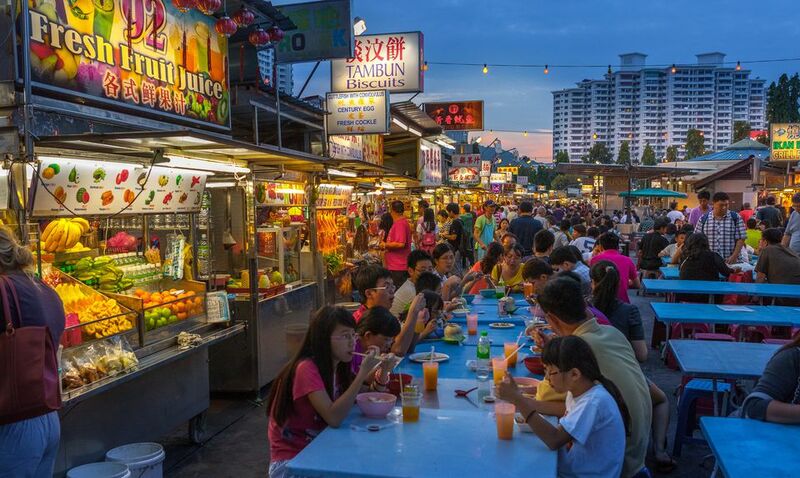 Although a handful of serious travelers still venture out to Gurney Drive for good food, the distance from tourists areas often discourages those who are too lazy to arrange transportation or leave the main areas in Georgetown. If the sprawling cluster of shared tables and street carts is a little too frenetic for you, there are plenty of sit-down restaurants opposite of the esplanade. Ranging from seafood and steamboat/hotpot places to steakhouses and familiar chains from home, you can keep everyone in a group happy. Lok-Lok: If you like to nibble, lok-lok is the stuff for you. It can be added to other dishes as a snack, or used as a starter before other food arrives. Lok-lok is boiled in water rather than oil, so it's a bit healthier than the usual. You'll find everything from meat and seafood to vegetables, Chinese dumplings, and quail eggs on the skewers. You get a choice of either sweet, peanut, or spicy sauce. Satay: If you have carnivorous tendencies, you'll salivate at the smoky smells of grilled meats on a stick over an open flame. It's the smell of Malaysia. Meat is marinated and then grilled in front of you; prices differ based on your choice of either beef, chicken, or mutton/goat. Meat is the only option; if you lean vegetarian, go find the lok-lok cart. Pasembur: A famous Malaysian Indian food, pasembur carts can be bewildering for the uninitiated. You begin by choosing from a variety of mostly deep-fried meats, seafood, vegetables, and tofu — the price depends on what you take. Next, your choices will be rough chopped and then covered with a slaw salad and literally drenched in a sweet, slightly spicy peanut sauce. The sauce is hot enough to recook the food. Rojak: Who would think that mixing fruit, chili seasoning, and a fishy taste would be a good idea? A favorite dessert in Penang, Rojak deserves at least a try. Chunks of fresh fruit are smothered in a sticky sweet tamarind sauce with a fishy aftertaste; crunchy objects and peanuts add a nice texture to the salad. What Are Those White/Yellow Balls? Regardless of whether you choose lok-lok, pasembur, noodles, or other dishes, you'll probably encounter mysterious white or yellow objects in the shape of squares and balls. That isn't tofu, it's fishcake. Fishcake is a popular filler item in Penang. The texture is rubbery; the fishy taste should be minimal if any at all. Call it a fish meatball, or in the case of lower-quality versions, a fish hotdog. If you don't like the taste or texture of compressed fish parts, ask to leave it out. As anywhere, street food with high turnover is safe. Gurney Drive stays busy, and competition is fierce. No one wants to make their customers sick. Pork is often used as an ingredient, even in dishes marked as "vegetarian." Vegetarian pretty well means that additional meat isn't added after preparation. Noodles and dumplings are often made with lard to hold them together, so even a "vegetarian" dumpling with vegetables inside probably has lard on the outside. Pretty well all soup broths are made with bone. If you have a seafood allergy, know that shrimp is a common ingredient. It's often ground into a paste and fermented (belacan) to flavor broths. The only sure way to avoid pork while eating at Gurney Drive in Penang is to only eat from the many Muslim-owned carts. These carts are marked with an Arabic symbol in green that reads "halal" underneath. Every driver on the island will know Gurney Drive, but you'll most likely be dropped in front of the mall. Don't worry: all the action is happening just behind! Walk through the center of the mall and the atrium past the open-air restaurants. Turn left at the coast and walk a short distance along the esplanade to find the food carts. Bus: Bus is by far the cheapest and most efficient way to get to Gurney Drive. Take bus #103 (less than US $1) from the Komtar Centre and get off at the Gurney Plaza stop. The last bus returns from the Gurney Plaza stop between 10 p.m and 11 p.m. Walking: Unlike most of the other points of interest in Georgetown, Gurney Drive is a long walk along broken sidewalks and busy roads. If you are staying near Jalan Chulia and the Chinatown area, expect at least a 45-minute walk. You can reach Gurney Drive by walking west along Jalan Sultan Ahmad Ahmad Shah from Jalan Penang. You can also walk west along Jalan Burma, then turn right on Lebih Burma to the coast. Taxi: Although taxis are clearly labeled "Metered taxi — haggling prices is prohibited," drivers have a reputation for overcharging tourists, particularly at night. They'll literally drive you in circles. If you want to take a taxi, flag one on the street rather than approaching one of the lounging drivers parked in tourist areas. Grab: Grab is Malaysia's rideshare service, similar to Uber. The app works much in the same way, although with Grab, you have the option to pay your driver in cash after the ride.